If someone were to ask me to describe the ideal setting, attendees, topic, and timelines for a PRI Course that I would want to organize and create, I would have responded the following way. First, I would truly like to instruct and teach in our PRI home, our Institute, our place of study, work and fun, our resource center, our reference center, and our service center where we can serve nourishment both in the form of food and didactical discussion. Second, I would invite a mix of course attendees and disciplines that were new to PRI; and some that took the first offered PRI courses offered years ago. (Joan Hanson and Lori Thompsen you will always remain young in my heart and mind). Third, I would limit the class to 20 attendees to maximize the individual interaction and participation. Fourth, I would want to have lunch with all of them and talk about things that they wanted to talk about with me. Fifth, I would pick objectives and subject matter related to the head, neck, teeth, vision, and neuro-patterning. Sixth, I would hold the course on a Friday and Saturday and I would do it at the astronomical beginning of spring in the Northern Hemisphere or mid-March. And finally, I would like to participate with some professionals that I work with in this community, since I lecture and talk to so many attendees, that work in different disciplines and also in different communities. Pat Brinkman-Falter BSDH, MS, RDH,CO, Susan Christiansen DDS, Janae Greer PT, DPT, and Charissa Johnson PT,ATC, thank you for coming to this community educational course. I respect and appreciate you all so much. I look forward to each and every course that is hosted here in Lincoln Nebraska, home of the PRI minds. After working with Dr. Heidi Wise for almost a decade, I have come to the realization that I learned the most about postural destabilization and de-patterning from her. Our vestibular system thrives on imbalance. We are upright processing, bipedal minded and protective patterned humans and our dependency on stability often limits sequential, reciprocal, and comprehensive interdependency which is needed for us to manage and handle complexity and creativity. I have witnessed this in the work that we do in PRI Vision on a weekly basis. Our visual perspectives can have a lasting impact on our behavioral and functional processing of input that is “new” or complex, only if it is flexible and accommodating to our need to remain calm. Dr. Wise will discuss how “optic flow” and the visual “lens” that is necessary for relaxation, can influence our need to remain flexible, calm, interdependent and egomotion minded. She has become a gift to our worlds of dependency and over achievement. We are sharing her with you and her presentation will be a take home gift. Our ability to acquire new passions, interests, and behavior requires recognition of our nescience and curiosity. I met Wren McLaughlin, I believe, in 2012, at a Temporal Mandibular Cervical course and remember how much diverse interest this women’s health clinical specialist had in so many areas. In an unintentional way she has a psychoenergetic sense to her that has resonated with me ever since; yet she reminded me that she has never taken a “psychology” course. Her gift of coherence is truly remarkable and her students get a course on psychology every time they hear her. That is why I am so happy she agreed to talk about how to fully stay creative by establishing a stable sense of self for those new, challenging, provoking and “unstable” opportunities or patterns that you do not want to miss or recognize for life changing enjoyment. This could be the presentation that you will not forget because of the way she “unlocks” those that are too certain and too stable. It is not too late to unlock your schedule and register for this symposium to hear this speaker. 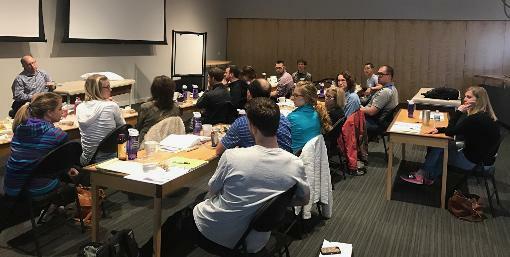 This past weekend, James and I presented PRI Integration for Fitness and Movement Course at a beautiful Pro Sports Club performance facility just outside of Seattle, WA. The first day was jammed pack with what attendees would say "ah ha" moments. One even said to me "You transformed how I look at the core. I will never look at an athlete the same again". How awesome is that?! I am so grateful to those who have supported the endeavor of putting this course together. Each time we teach it, I just get more passionate and inspired to share the material because I see how well it received and how many people enjoy learning it. This time we broke lab up into stations and allotted more time for attendees to experience more exercises. I also broke the exercises up into groups which helped categorize functionality and use with the many new exercises found in this manual. This Seattle course was jammed packed with an equal ratio of attendees who have never been to a PRI course with those who have been exposed to the material through introductory and secondary courses. I love the diversity that exists in these courses. It really facilities a learning environment and challenges us to keep things simple and practical --- which I find those most experienced in PRI really like that. One attendee commented "This course brought it all together for me. This would be a great first course for people to take on their PRI journey". Let's face it, the plethora of knowledge available to learn for wellness, fitness, rehab, and movement health professionals is nothing short of overwhelming. Yet learning how to facilitate better breathing, evaluate and maintain movement health and posture three dimensionally is some of the most fundamental and important things we can do for ourselves, as well as our clients, patients, and athletes. Thank you to Carl, Amanda and the amazing staff at the Pro Sports Club for being gracious hosts! Next course: London in a few weeks! 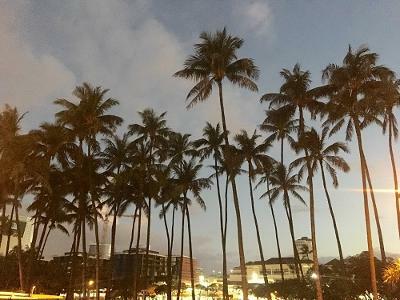 Postural Respiration-Honolulu Hawaii. Thank you to my friend Randy Fukuji, PT who’s strong interest and passion is the primary reason we have been able to teach PRI on the beautiful islands of Hawaii over the last couple of years. And thank you to all the employees of the host clinic, Fukuji and Lum Physical Therapy Associates, for your kind hospitality and the Aloha Spirit I feel from each one of you each time I am with you. You guys are the best! 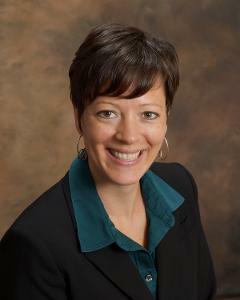 And thank you to my lab assistant, Tina Haiser, PT, PRC for her expert assistance throughout the course. I have been to Hawaii a few times and even taught Myokinematic Restoration on one trip, but on this trip, I learned that PRI is much more Hawaiian than I ever realized. In Hawaii, the word “ha” means breath, or the sacred breath of life that enlivens every living being and unites us as one in spirit. Kinda deep, but kinda cool. The word “aloha” is one of many Hawaiian words that contains “ha” in it. This word is a warm and gracious greeting, meaning both hello and goodbye. It also means love, affection, warmth, kindness, compassion, peace and mercy. When you say “aloha” to someone, you are expressing your warmth and kindheartedness toward them, and also acknowledging the sacred breath of life within them, affirming that their spirit is one with your spirit. Who knew Hawaiian hellos and goodbyes had such deep meaning? When I began teaching Postural Respiration to these beautiful Hawaiian people, they soon saw the “ha” in our message. Attaining a state of exhalation on one side of the body to overcome pathological hyperinflation resonated with them. They understood saying goodbye to breath on one side of their body so they could say hello to breath on the other side of their body. It seemed to affirm something they already knew. It really came together for me when one of our gracious hosts and owner of the host site clinic, Art Lum, PT, stood up and expressed his desire to give each one of his patients an alo”ha” on the left side of their body so they can in turn realize alo”ha”, or the breath of life on the right side of their body. Wow. The truth and significance of what he was saying was powerful. I just stood there speechless for a few seconds, reflecting on some gems from my early PRI learning. I thought back to some of my discussions about PRI breathing mechanics in my early years of mentorship with Ron Hruska. I remembered him saying, “James, this is not pursed lip breathing or powerful exhalation we are talking about. It is more like a complete sigh out or a long haaaaaa breath.” I thought I got it then, and maybe mechanically and neurologically I did get some of it. But the fuller meaning of this sacred word “ha” did not appear for me until this last weekend. Words like “aloha” and “mahalo” for these beautiful Hawaiian people are more than just direct translations of our English words “hello” and “thank you”. They are spiritual affirmations of the life giving breath within each of us and also expressions of unity, compassion and love. So mahalo Art, for helping me realize some things that people in your beautiful culture already know. And mahalo Ron, for giving me the early pieces of a science that would later help me appreciate the deeper meaning of the word “ha”. IFAST! Indianapolis was the location of Myokinematics where I spent this past weekend. Many people are aware of IFAST and the team of Bill Hartman, Mike Robertson, Ty Terrell, Jae Chung, Lance Goyke and Tony Giuliano. These are good guys with good hearts. This was a weekend of fun and fellowship as well as fantastic learning. Bill Hartman was a fantastic host to a large group of attendees. Many were first timers to PRI and found the course to be a paradigm shift and a "game changer" as one of them put it. I had the best time this past weekend as I got the opportunity to sit and listen to Dan Houglum MSPT, ATC/L, PRC, one of our newest instructors. 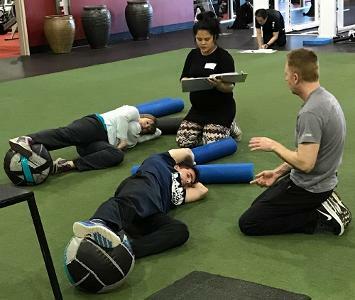 Dan took the reins and led the class both days and taught them about the power of human asymmetrical movement and how to control pathological compensatory strategies. As always the class was enlightening and informative and if you are planning a foray into the world of PRI then I would suggest this "front door" of entry called Myokinematics. There is not a week that goes by in my world of PRI practice that someone does not either lament about or experience dizziness, motion sickness or nauseousness. I had the opportunity to talk Dr. Thomas Stoffregen over two years ago about his work related to Motion Sickness and since then have read many, is not most of his articles that have been published on motion sickness as a movement disorder. He works at the School of Kinesiology in Minneapolis MN and I can still recall the very first article I read that he wrote about this topic of “motion sickness” happening when we acquire unstable control of bodily orientation. Also he believes recovery begins when we reacquire stable control of the body. His suggestion that the symptoms similar to motion sickness or those that are related to motion sickness, arise from a temporary or transient movement disorder. This was very intriguing to me, because of my recognition of similar events that occur at a time where adaption to asymmetry appeared to be very highly correlated with symptoms of dizziness, nauseousness and motion sickness. These correlations were becoming even more evident based when the patients I evaluated were also being evaluated and co-treated with other integrative disciplines. Dr. Stoffregen will be presenting on both days of this year’s Interdisciplinary Integration Symposium and his experience and research will help all of us understand how those who have spent life on the moving sea and require a period of adaptation to “get their sea legs” can also help us better understand ways to control and stabilize the moving body with “their land legs”. I have enjoyed every conversation I have had with him and look forward to meeting him personally because of his passion to study an area that I see every day, or week, with patients who believe they are on a water based vessel. His direct comment to me was, “I would like to relate classical motion sickness to dizziness, migraine, concussion and quantitative ‘signatures’ of health that may exist in patterns of bodily movement.” If you are working with patients who have dizziness and sea legs when on land you do not want to miss this presentation and discussion on how it relates to PRI patterns! To learn more about Interdisciplinary Integration click HERE. This past weekend I was on the road again! 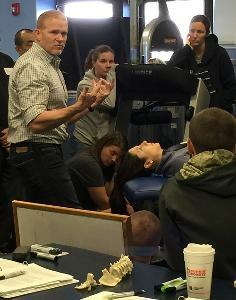 Teaching Cervical Revolution and being hosted by Mike Roberts MPT and his gang at Central Mass PT. These folks are the absolute best! Jacqueline Shakar DPT, Beth Reinach MSPT, Emily Mandara DPT, Laura Kidman MSPT, Dan Everson PTA and Michael Cumen DPT were all just fantastic and made all of us feel welcome. I also want to thank Anita Furbush PT, PRC and Donna Behr DPT, PRC for being such excellent lab assistants. Donna is an excellent clinician and I relied on her and Anita a great deal. I can see why Donna's new practice is thriving. 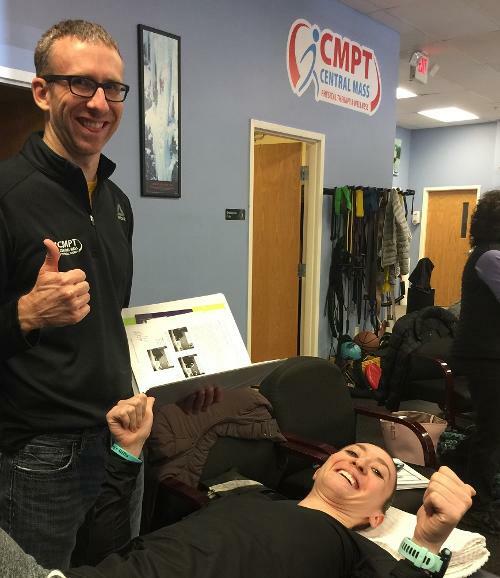 Shelly DeRuiter PT, PRC was also on hand and she is such a wonderful asset to have in a class. Shelly, it was good to see you. I had two of my previous employees from my old clinic "The Cantrell Center" Cindy Rice PTA, PRC and Jamie Jaros Lochner DPT, PRC. You two are truly skilled clinicians. All 33 attendees were on hand to learn of the powerful influence of the temporal mandibular cervical chain. This polyarticular chain of muscle has such a profound influence on the neck... and teeth have a profound influence on the TMCC. How do we know when to start a dental plan? How do we work with a dentist? How do we know which oral appliance to use? These questions, and more, are broached and the reviews of this class are good. I think Ron Hruska hit a home run with the manual and the class. Looking forward to seeing you there! 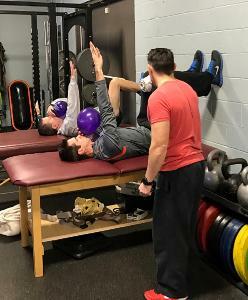 Precision Fitness hosted their first PRI course, Postural Respiration, this past weekend with about one third of the course being brand new to PRI and another third of the course being new to Postural Respiration. The balance of new attendees and new veterans provided a flow that kept everyone moving in a forward progression easily for the entire class to absorb and learn new material as well as deepen previous learning. This course was diverse in that their were numerous PT's from athletic departments at universities from Wake Forest to Florida State. An athletic trainer that works with solders was present and enthusiastic about taking his sixth course to deepen his skills with treating our fighting men and women. And Jennifer Smart, PT, PRC brought her wisdom and skill to make this weekend flow and to fill in any gaps of knowledge to aid in the teaching process. Did you know she has sailed halfway around the world in a sailboat with her family that her husband made? She also has a son who lives in a house that he made and just rode his bike to the tip of Baja California and back to the U.S.A.! Ole! There was so much enthusiasm from this group with a bunch of people wanting to become PRC's and PRT's. Cornelius may just be a new "hotbed" of PRI. Along with it being in the heart of Nascar racing! !